Make some time for Dad before things kick off. Whether it’s a first look with your spouse-to-be or your father, we always recommend them. As NY & NJ wedding videographers, we are storytellers at heart, after all, and first looks are just another beautiful chapter with which to tell your story. However, we also know that they’re not for everyone. 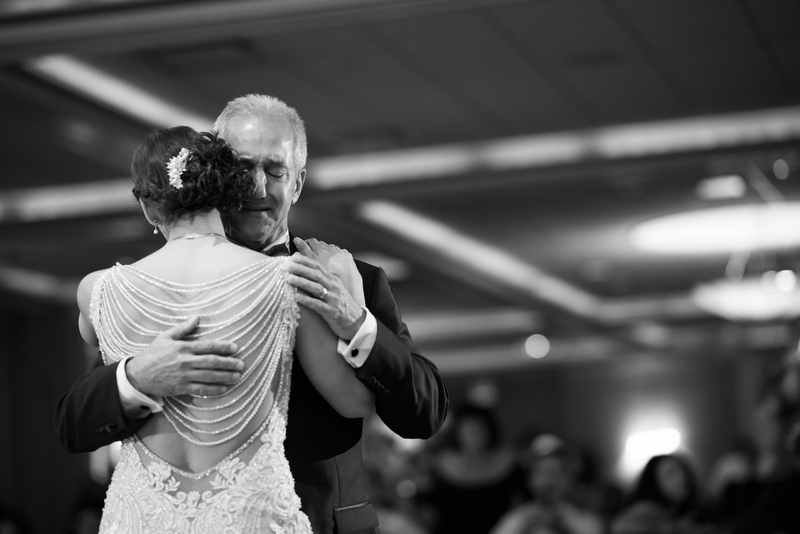 So, if you don’t want to do a first look, for whatever reason, but you’re looking for ways to make your dad more involved in the big day, then you could simply make a point to spend some time together before the ceremony. He could join you at the end of your prep time, for instance, or you could simply set some quality time aside at your ceremony space or even on the way to it. The point is to get some time with Dad before the festivities get going. While we’ve been a part of some truly spectacular ballroom weddings, country club celebrations, rustic affairs, etc.,some of the best locations have been right in the house or backyard of one of the newlywed’s family homes. And trust us, if you’re looking for ways to make Dad feel more special, then there are few better options than walking down the “aisle” with your father when that aisle happens to be from your childhood home to the backyard. It’ll make that moment and others like it that much more powerful, but you don’t have to have your ceremony or even reception at your house. You could just do your prep there and it doesn’t necessarily have to be your house, either. You could also use the same church your grandparents were married in, for example. You get the idea. Make an entrance & take some special pics. If you’re father’s going to be walking you down the aisle, or if not and you just want to make a memorable ceremony entrance with him, then don’t hold back. As long as it’s within reason, it can be a great way of making Dad feel more involved. From there, you could also simply consider setting some time aside to capture some great photos and footage of just you and your father. You may also want include your partner in some as well, but simply giving your dad the spotlight for a bit can go a long way. At the end of the day, it doesn’t typically take much. The bottom line is that if you and/or your partner are lucky enough to still have your fathers in your lives, then it only makes sense to do what you can to make them feel included and appreciated. And the truth is that it doesn’t tend to take much. We hope these tips help! About Us: Live Picture Studios is composed of a team of highly-skilled NY & NJ wedding videographers, photographers, and editors who’ve been telling cinematic love stories for years. At LPS, we always create to inspire. Check out our photo gallery and video gallery to see some examples.